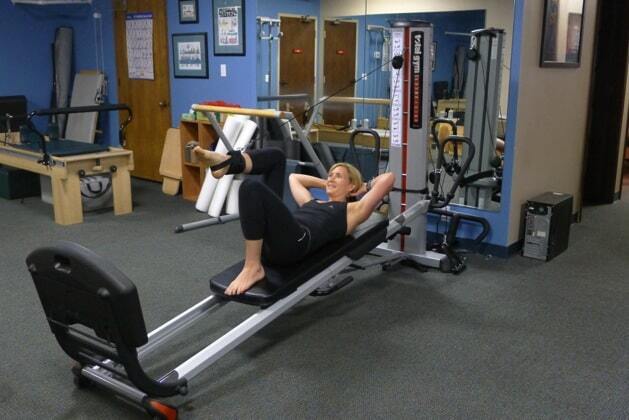 The leg pulleys attachments for the Total Gym are a fun, new way to train your core and lower body. 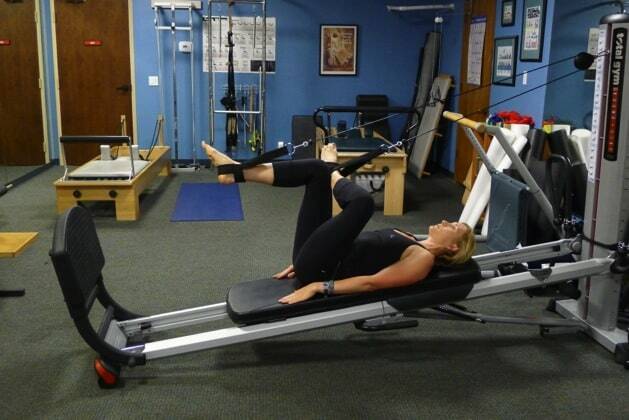 The pulleys can assist with everything from strengthening to stabilizing and stretching. 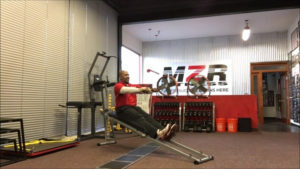 Unlike single purpose weight machine, leg pulleys allow for greater range of motion and versatility; you can work one leg at a time, alternate the legs, or work them bilaterally. 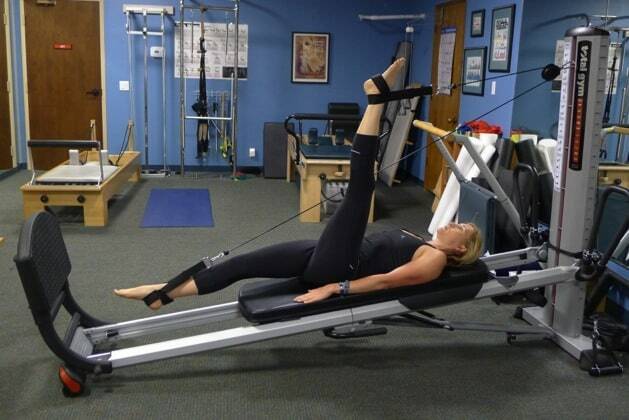 With the Total Gym leg pulley attachment, a simple leg lift will have a whole new meaning. 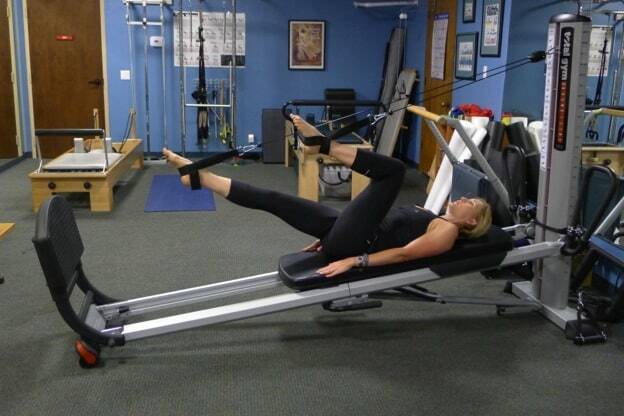 With a simple change of your body position or leg pulley attachment, the intention of the exercise can easily shift from strengthening to stabilization or to stretching. 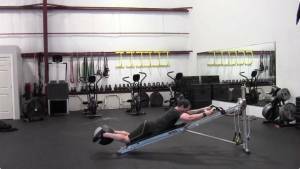 Here is a sample routine that flows from an emphasis on core strengthening and stability to a lower body workout that focuses on strengthening, and ends with a cool down stretch routine. There are various ways to enter the pulley, however this may be the simplest way to start until you are familiar with them. Attach the pulleys at the top of the tower. Holding the pulleys in your right hand, face away from the tower and straddle the glideboard. Push the glideboard up the rails and sit at the lower one third of the board, then place your feet onto the squat stand. Roll onto your back, allowing your head to be at the top edge of the glideboard. 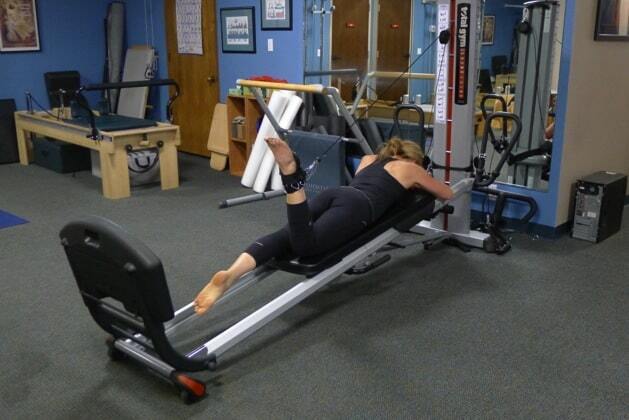 Bring your right foot toward your body and place harness around the arch and back of the ankle (Achilles tendon). Hold the cables to assist with stabilization and press the right leg out while simultaneously bringing the left leg into the chest. Place the left foot into the harness and straighten the leg toward the right foot. When moving through the one legged exercises, the ankle cuff is optimal. The ankle cuff has multiple loops, called D rings. These rings are designed to provide an optimal line of pull, in other words the cable will resist at the right place to target the intended muscle. For instance, when on your back the focus will be on the front of the thigh, the quadriceps. The pulley will be attached to the backside of the cuff, at your Achilles tendon. When working the back of your leg (hamstrings and glutes), you will have the pulley on the front side. 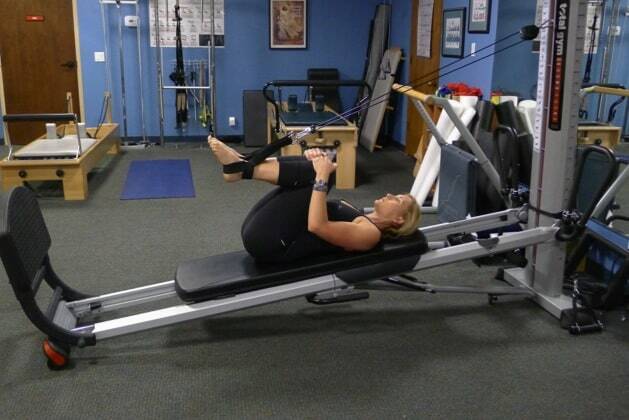 Lastly while working the inner thigh (adductors), you can place the pulley toward the outside. Attach one cable to the glideboard, and the other on a D ring of the cuff. Hold the cuff and straddle the glideboard. Push the board up the rails and sit toward the lower end of the glideboard. Place the feet on the squat stand and roll onto your back with your head supported at the top end. Bring one foot in toward your chest and slide it through the loop/strap, similar to putting on a boot. With the arch around the arch of the foot, secure the cuff around the ankle. When securely in the ankle cuff, transition the foot on the squat stand onto the glideboard. Note some individuals prefer to put the cuff on first then lie on the glideboard and attach the cable. For a more detailed explanation of how to attach and get into the ankle cuff and leg pulley, go to http://www.totalgym.com/p-82420-leg-pulley-system.aspx. Click on Download Documents under More Information and from there you will be able to download an instructional guide. With all exercises the head may be up or down. 1. Bicycles: Start with both knees bent then bring one knee toward your chest while the other straightens toward the squat stand. Perform this movement allowing the glideboard to move, then change the tempo and keep the board still. Repeat 45-60 seconds with the board moving and 45-60 seconds with the board still. 2. Scissors: With both legs straight toward the ceiling, bring one leg toward the body while the other simultaneously reaches for the squat stand. Perform this movement allowing the glideboard to move, then change the tempo and keep the board still. Repeat 45-60 seconds with the board moving and 45-60 seconds with the board still. 4. Leg circles: With both legs straight toward the ceiling, open the legs slightly wide than shoulder distance out to the sides then arc them around toward each other. With the legs together, return to the start position. Then reverse the exercise by hinging the legs away from the body, open the legs to the sides, then bring them up toward the body and to the start position. Watch for the low back arching away from the glideboard. If this happens, decrease the range of motion. Repeat for 30-45 seconds in each direction. 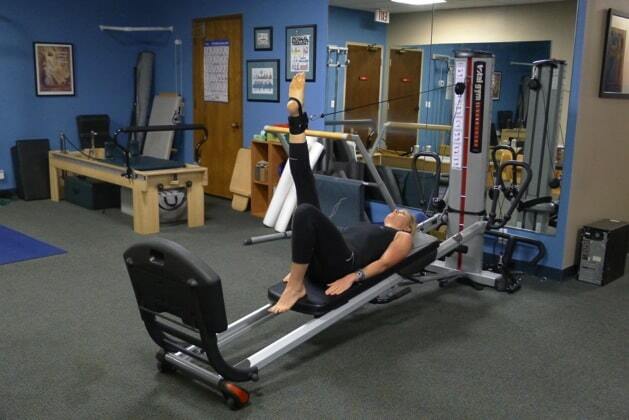 The above exercises can be furthered challenged with arm movements, which mimic the leg movements. To challenge the core even more, the above can also be performed with the ankle cuff. Ensure you perform equally on both sides. Transition to the ankle cuff. 1. Straight Leg Hip Extension: Back of the legs (Glutes and Hamstrings): On your back with the cable attached to the top of the ankle cuff. The other leg can be bent on the glideboard to support the trunk. Pull the leg down toward the floor. Repeat 45-60 sec per side. 2. Leg Thrust: Hip Extension: Back of the legs (Glutes and Hamstrings): On your back with the cable attached to the top of the ankle cuff. The other leg can be bent on the glideboard to support the trunk. Start with the knee bent in toward the chest then press the leg out straight. Repeat 45-60 sec per side. 3. 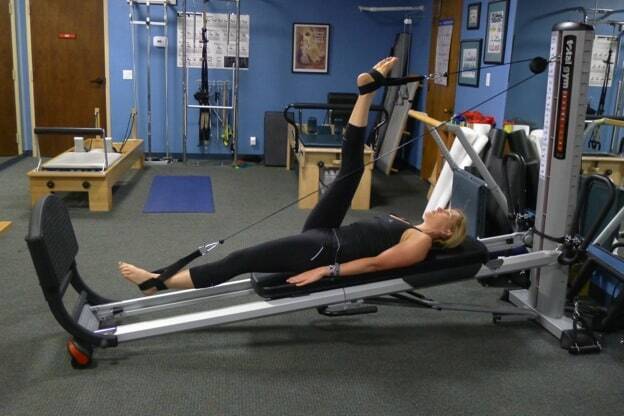 Inner Thighs (Adductors): Lying on your side with the cuff on the top leg, attach the cable to the side of the cuff. The bottom leg may be bent supporting the head, and pull the leg toward the floor. Repeat 45-60 sec per side. 4. Front of thigh (Quadriceps): Transition the cable toward the backside of the cuff, then turn onto your belly. With the thigh remaining in contact with the glideboard, bend and then straighten the knee. Repeat 45-60 sec per side. Note that this section can be done with double leg pulleys or with the ankle cuff. With all exercises the head may be up or down. 1. Hamstring (Back of the legs): Like the scissor movement described above, both legs will be straight with one leg toward the body and the other toward the squat stand. Hold the stretch 45-60 seconds then switch sides. 2. Adductor (Inner Thigh): Like the leg circles, the legs will be straight and open out to the sides. Hold 45-60 seconds. For an even deeper adductor stretch, bend the knees to 90 degrees. Note you may have to push a little into the straps to ensure neutral spine. Hold the stretch 45-60 seconds. 3. Figure 4 (Outer Hip): With the legs straight, cross one leg and rest the ankle across the opposite knee. Then bend the other leg. Hold the stretch 45-60 seconds. 4. Lower Back: Bend both knees into your chest and focus on breathing and expanding the breath into the sides and the back of the ribcage. Hold the stretch 45-60 seconds. 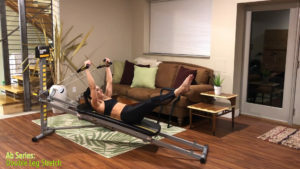 We hope this information will help you explore the powerful combination of exercises that can be done using the Total Gym leg pulley attachment. Let us know if you have any questions in the comments section below! Hi, I’m a new owner of a total gym fit, but was surprised to find that the leg attachment pulley system only allows you to do one leg at a time. 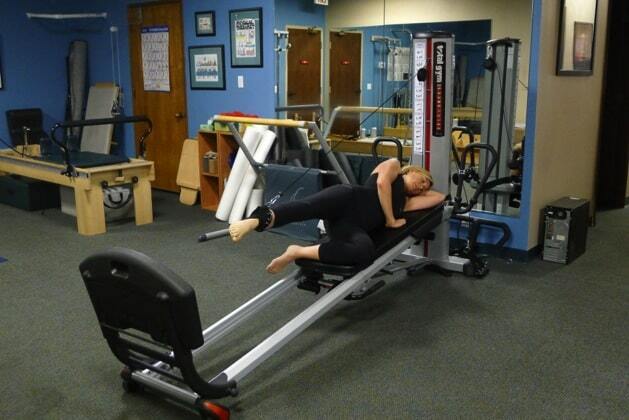 Do you know if the leg attachments on the total gym on your site will work on the total gym fit? The Leg Pulley Attachent on the website (http://totalgymdirect.com/shop/total-gym-leg-pull/) fits the Total Gym FIT. 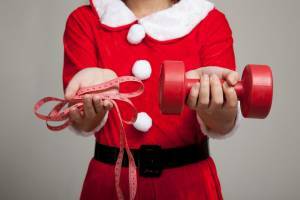 Hello, i just bought a total gym 1400; do you know if the leg attachments on the total gym on your site will work on the total gym 1400?